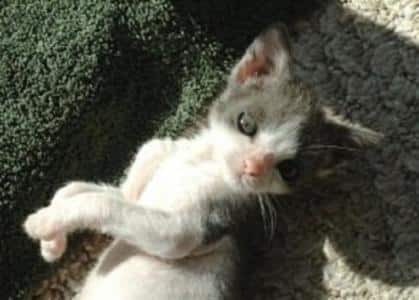 We’ve all heard stories about people committing selfless and heroic acts to save animals, but this story about a man who saved a kitten in his backyard is really something special. 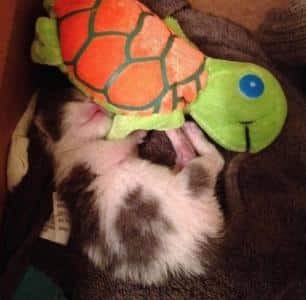 This selfless act won him a friend for life! This story about a young man saving a kitten exploded on social media when he posted about his new friend. It all started when he had heard an odd sound coming from his backyard and so, he decided to investigate. 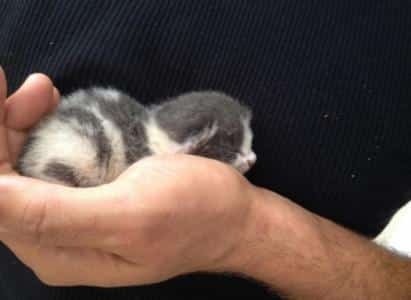 Meet the young man who saved a helpless kitten from his very own backyard! There was a meek sound coming from the fenceline. As he got closer, he determined that it was meowing. 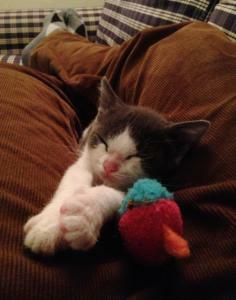 There was a kitten who got lost in his backyard. He frantically moved the rocks out of the way and brought the kitten out. She was so tiny and cute! What he did next is truly unbelievable! She appeared to be a runt who must have been left behind when the mother moved the rest of her litter elsewhere. 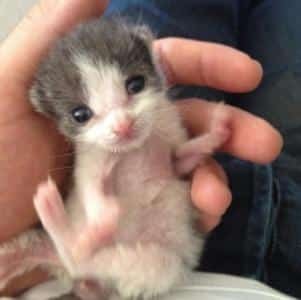 “Found this little one in my backyard in a hole under the fence,” said the young man in his post. He gave her the name ‘Baby’. He woke up early every morning and even throughout the night to check on his Baby and feed her. He also came home from work every 2 hours or so, to feed Baby from a bottle. He mentioned in his post, that “She didn’t open her eyes for 10 days.” Baby was only weeks old when he found her, so she was not yet able to open up her eyes. But on day 11, she finally did! 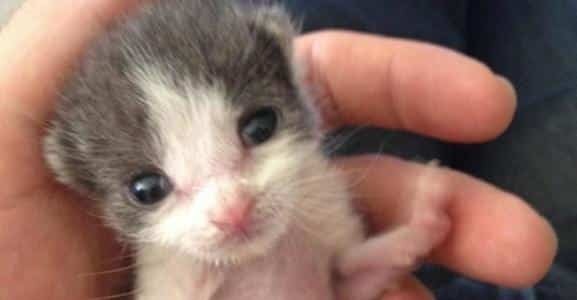 After giving Baby so much love and attention, she finally popped open her eyes and gazed upon her rescuer. Instantly, it was love at first sight. Baby was smitten with the young man! But with her new eyes, she also became a bit of a handful! 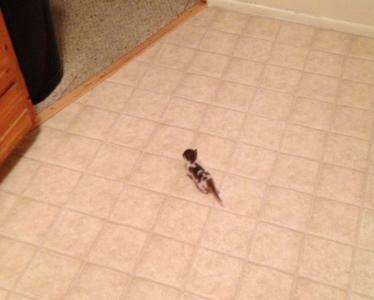 As soon as she could move around, she was off exploring the house. She was constantly on the move until she found one of her favorite spots to relax in! 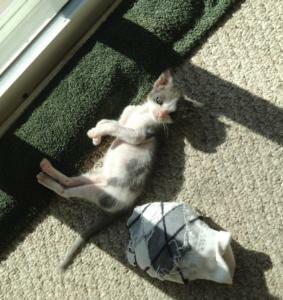 Baby absolutely loved to spend time lounging in the sun. The young man snapped this picture, because he just couldn’t get over how small she still was after continuous feeding and care. She certainly was the runt of the litter! Just look at how she compares in size to this rolled up ball of socks! 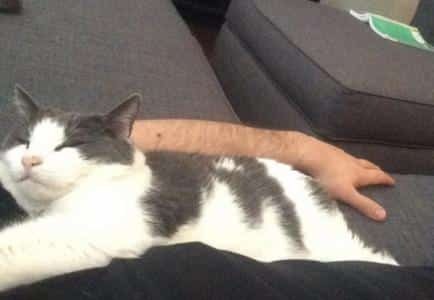 Now that she’s grown older, she has filled out some more and become a healthy cat, all thanks to the love from her human dad. She shows so much love and gratitude to her hero dad. 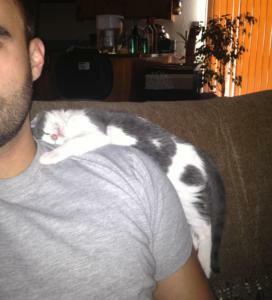 You can tell she’s quite comfortable with him as she naps on his shoulder. The pair have daily naps and cuddle time together. 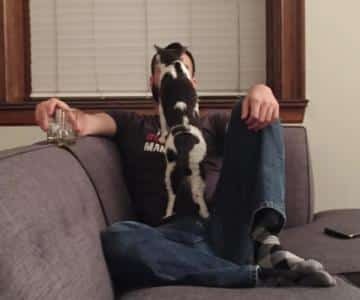 Just about every time dad gets cozy on the couch, Baby will pounce on him and make herself comfortable. She constantly demands scratches and love from him. 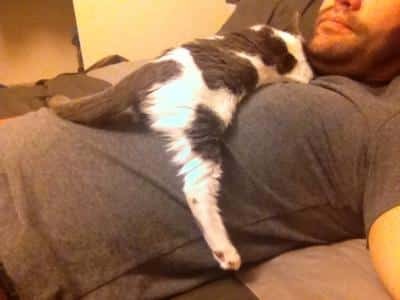 Baby gets especially needy when her dad returns from work. 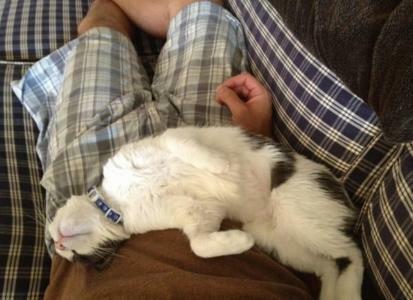 He mentioned that “She always pays special attention to me when I get back from a work trip.” She doesn’t like when he leaves her for more than a day. 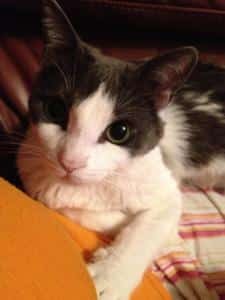 Although the young man had stated that he had never wanted a pet, he was so glad that this little kitten “meowed” her way into his life. He doesn’t know what he would do without her now that he has her. And, we would have to say that it looks like the feeling is mutual! This young man’s story is one of thousands out there! There are so many inspiring stories about humans going out of their way to ensure the safety and well-being of animals. This poor little piglet lost his hind legs but luckily he had some very special humans to look after him. 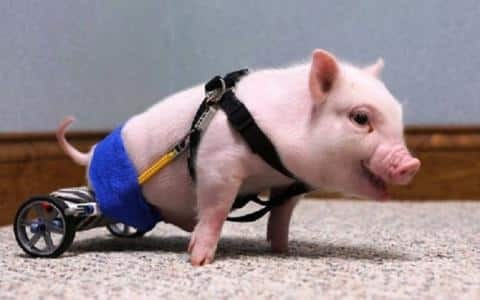 The piglet was fashioned with a new set of legs, or wheels rather, to get him back up and at it again! Thanks to the help from his human friends, he was able to rock and roll! 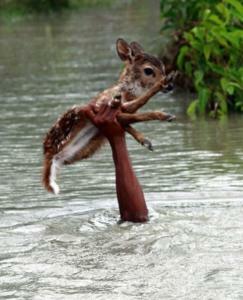 This fawn was being swept away by the current in this flooded area when a man courageously dove into the angry waters after her. Amazingly, he emerges victoriously here with the fawn in hand! Firefighters have one of the toughest jobs out there. 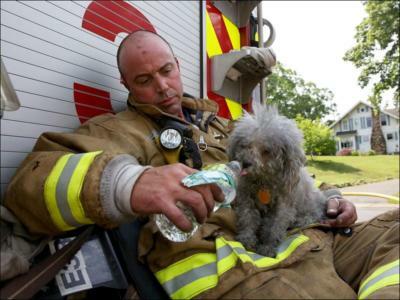 They battle smoke and flame to save those in need and sometimes those in need aren’t always humans. This little pup was trapped inside of a smoke-filled house until the firefighter swept him up in his arms and rushed him out of the house to safety. Now time to get him all cleaned up and hydrated! This man was enjoying a day relaxing at the beach when all of a sudden a dolphin came too close to shore. The dolphin rode the waves a little too far into the beach and ended up getting himself beached on the sand. With no current to drag him back out to sea, he was trapped there. 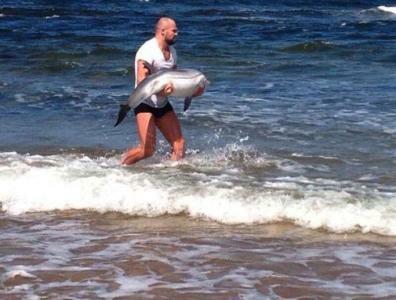 The man quickly rose to action and lifted the dolphin from the sand and returned him to the ocean. Hero’s come in all shaped and sizes. They’re not always adults, but sometimes young children. Children know how to recognize, just as well as adults do, when someone is in trouble. 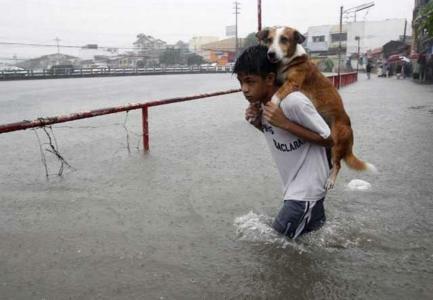 Just take a look at this boy bravely carrying a dog through his flooded village to safety. 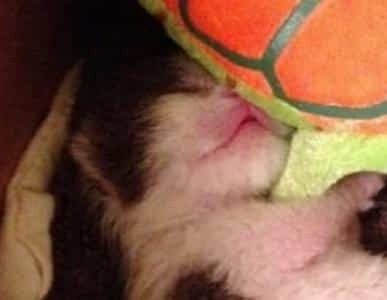 We hope this story of the rescued kitten and the heartwarming actions of people being everyday heroes has left you with a feeling of happiness! You would probably agree that it’s certainly reassuring to see that there are such amazing people out there!